This article is about testing your computer's power supply. 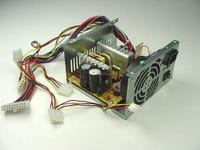 There are certain simple steps you need to adhere to in order to test the power supply of your computer, such as turning off the power switch and removing the plug from the power supply. Then you need to remove the cable and dismantle the power-supply section. This is done to completely remove the power supply. Then locate the ATX connector, the black and green wires, and bond them together. Subsequently, you need to connect the power supply and switch on the system again. After ensuring the system ventilation is functioning well, check if the connection is correct. The 12 volts of power supply should be displayed on the Molex. 1. Turn off your power switch and remove the plug from the power supply. 2. Remove the cable from the CPU and start unscrewing the power supply section in order to remove the whole power supply (square metal box) from the CPU. 3. When done, locate the main ATX connector and find the green wire. 4. Also locate the black wire near the green wire and with the use of a paper clip, connect and safely bond the two together with a piece of isolating tape. 5. Switch back the power supply and switch the system on again and ensure that your system ventilation is working. 6. To check whether the connection is correct, the Molex in between the yellow and black wire should display at least 12 volts. A computer's power supply can be calculated by using a power supply calculator. This is not an easy task as it requires you to give importance to every single part of your computer from the CPU to the Graphics Card, from Primary Optical Drive to Third Optical Drive and from liquid cooling to the wireless card. One should list all the details of these and then, using a calculator, you can work out the power supply. Published by netty5. Latest update on June 26, 2012 at 04:55 PM by Jean-François Pillou. This document, titled "How to test your computer's power supply," is available under the Creative Commons license. Any copy, reuse, or modification of the content should be sufficiently credited to CCM (https://ccm.net/).